Buljan Apartments are located only 100 meters from the beach in Okrug Gornji on Ciovo island, and only 20-25 minutes walk (3 minutes by car) from the city center (approx. 2.5 km). 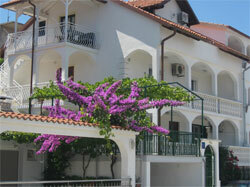 All apartments have spacious terraces and all are air conditioned. In the late afternoon step on the terrace and enjoy the view. Mastrinka is a coastal village on the island of Ciovo. Administratively, the urban settlement of Trogir. It boasts clear waters, beautiful beaches, long promenades along the sea and pine forest along the beach. Trogir offers a rich night, entertainment and cultural life (exhibitions, shows, music evenings). 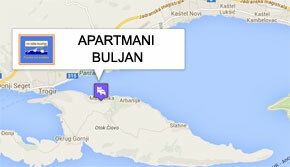 We wish you a warm welcome and a pleasant stay in apartments Buljan.